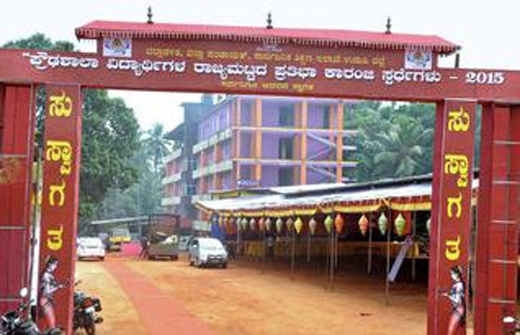 Udupi, Dec 15, 2015: All roads seem to lead to the three-day State-level Pratibha Karanji programme to be held at the Vidyaniketan Public School at Kaup in Udupi district from December 15 to 17. More than 2,000 high school students from across the State will participate in 25 categories of individual competitions and six categories of group competitions. Individual competitions include elocution, Carnatic, Hindustani and folk music, Bharatnatyam, clay modelling, mimicry, essay writing, debates, art, ‘rangoli’ and ghazal, while the group competitions include drama, quiz, folk dance, ‘kolata,’ on the spot science model making and ‘qawwali’. Students from eight educational districts have arrived at the venue so far. Those from other educational districts are expected to arrive here on Dec 15, Tuesday. Arrangements have been made to bring students from other districts from the Udupi Railway Station and Udupi bus terminus to Kaup. Udupi DC Dr R. Vishal held a meeting of officials at the venue on Dec 14, Monday and inspected the arrangements. “There should be proper communication to all directions so that there is no inconvenience of any kind to the students,” he said. Arrangements for proper distribution of food had been made at the venue. The food arrangements were being overseen by a team of 41 teachers under the Correspondent of the School K.P. Acharya. “The food quality should be tested by the officers of the Department of Health and Family Welfare,” DC Dr. Vishal said. The students who had topped their schools in SSLC examinations held in March-April 2015 would be taken on an excursion in Udupi and Kaup. The headmaster of Belapu Government School had been appointed as the nodal officer for the purpose. Dr. Vishal told the officials to be cautious while appointing judges for the competitions. All care should be taken so that there were no allegations of partiality, he said. Accommodation facilities for the students had been made at Kaup. “All efforts should be made to see that there was no water problem. Priority should be given to sanitation. The area around the stage should be kept clean,” he said. On Dec 15, Tuesday, a procession of students would begin from the Dandatirtha School at 2.30 p.m. and reach the venue at 3.30 p.m. Ajay Shet, Principal Secretary (Primary and Secondary Education) would inaugurate the programme at 4 p.m.
Basavaraj, Joint Director, Karnataka Board of Secondary Education, would distribute the prizes at the valedictory function at 3.30 p.m. on December 17. Every child is born with some ability or other, it is duty of the parents and teachers to guide them to the right path. Its was a good opportunity to the students.